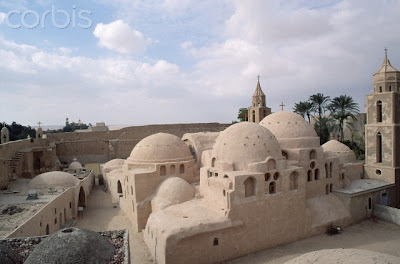 The Egyptian Armed Forces issued a statement on their Facebook page denying that any attack took place on St. Bishoy Monastery in Wady el-Natroun, "Reflecting our belief in the freedom and chastity of places of worship of all Egyptians." The statement went on to say that the army just demolished some fences built on State property and that it has no intention of demolishing the monastery itself (video of army shooting at Monastery). "We contacted state security and they said there was no police available for protection," said Father Bemwa," So we called the Egyptian TV dozens of times to appeal for help and then we were put in touch with the military personnel who told us to protect ourselves until they reach us." He added that the monks have built a low fence on the borders of one side of the monastery which is vulnerable to attacks, on land which belongs to the monastery, with the monks and monastery laborers keeping watch over it 24 hours a day.